Our Website is so cutting edge that our competition goes to it on a daily basis to Copy it! If they can't be original on their marketing, why would you use them to sell your home? What Can Dave Jones Realty Do For Me? We offer a TRUE UNMATCHED Marketing program. When it comes to selling your CT home, you, as a seller, are faced with three choices: Try to sell it yourself, hire your friend/neighbor/relative to sell it, or hire an experienced listing agent. 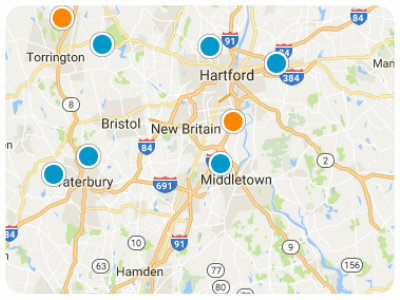 My Real Estate Brokerage specializes in representing Connecticut area sellers, I would hope you would give the Dave Jones Realty team a close look. We KNOW the market better, it is what we eat, sleep and breathe. Dave Jones Realty understands the many nuances of the Connecticut real estate market. Our Real Estate brokerage has survived the “ups and downs” of the Connecticut Real Estate market, and we know how to get you top-dollar for you home. We NEGOTIATE as if each deal were my own home. Our team has a firm grasp on the art of negotiating the current Connecticut Real Estate home value, and has a solid track record of negotiating the best deal possible for our clientele. We CARE about our clients. The greatest reward to come from your business is not a commission check. We measure our success by the 98%+ referral rate that we receive from our existing clients. Your home is your most valuable possession, and deserves to be treated as such. You deserve the support and guidance of an experienced team of experts, and our team is ready to help you through the process. Our listing agreement comes with an UNCONDITIONAL GUARANTEE (you can cancel at any time with no cost or obligation) to ensure that you are not “locked in” with someone you don’t want to do business with.